A baby orangutan normally spends up to eight years in the full-time care of its mother. She transmits to her young the skills vital to survival during the normal 40-year lifespan of an orangutan in the wild. This includes tree-climbing, nest-building, and foraging for the more than 200 plant sources that make up the vast quantities of food needed to power its “swinging” lifestyle in the heights of the rainforest. When baby orangutans lose their mother, which all too often happens in razing the rainforest for farmland, road-building, the timber industry, or when humans capture the young apes as pets, the juveniles have virtually no chance of surviving on their own. And for an endangered species in which a female may only have two or three offspring over an entire lifetime, every individual counts. 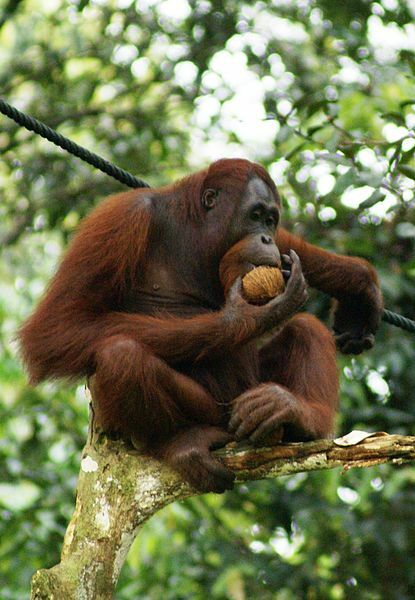 The perilous existence of orangutans, once found throughout Southeast Asia, but now remaining only in small populations in Borneo and Sumatra, was recognized by the founders of the Sepilok Orangutan Rehabilitation Center in the state of Sabah, northern Borneo. Opened in 1964 as the first rehabilitation facility for the species, the center rescues orphaned orangutan babies and raises them to return to the wild as capable adults. A visit to this pioneering facility is one of the highlights of our 14-day Natural Wonders of Borneo adventure. Depending on its age at admission to the center, a young orangutan may spend as many as seven years in preparation for release back to the forest. The babies are initially under 24-hour human care, gradually growing into a more social nursery setting with other individuals their age. Younger orphans are paired with older ones, who assist them in learning to climb and forage. Graduates of the rehabilitation program are released into the surrounding Kabili-Sepilok Forest Reserve, but have an open invitation to return to the twice-a-day feedings at the center. The menu is intentionally limited in calorie count and flavor, to discourage the apes from relying solely on this food source. But for the newly released, these feedings bridge the transition to independent sustenance. And appearance of the center’s alumni help to support the next generation of orphans, for the feedings take place up on tree platforms within viewing range of boardwalks accessible to human visitors. Admission fees to these boardwalks, as well as funding by the Sabah Wildlife Department, provide the financial backing to keep the center in operation. For a young orangutan, it “takes a village” to substitute for a mother’s nurturing to be wild.